I'm reading Debbie Bliss's The Knitter's Book Of Knowledge, A Complete Guide to Essential Knitting Techniques. If you are a knitter you are probably aware of Debbie's work. You can check her out on Ravelry here. She is listed as having 1978 published designs.As you would expect a portfolio of that size leads to a lot of knitting knowledge and much of it is in this book. I'm often asked for recommendations on reference books and I'll be adding this one to my list. It has eleven chapters and can take a knitters all the way from Chapter 1: Yarn and Needles, Chapter Two: First Steps to Chapter Ten: Designing knits and one of my favourite chapters (the final one) Troubleshooting. 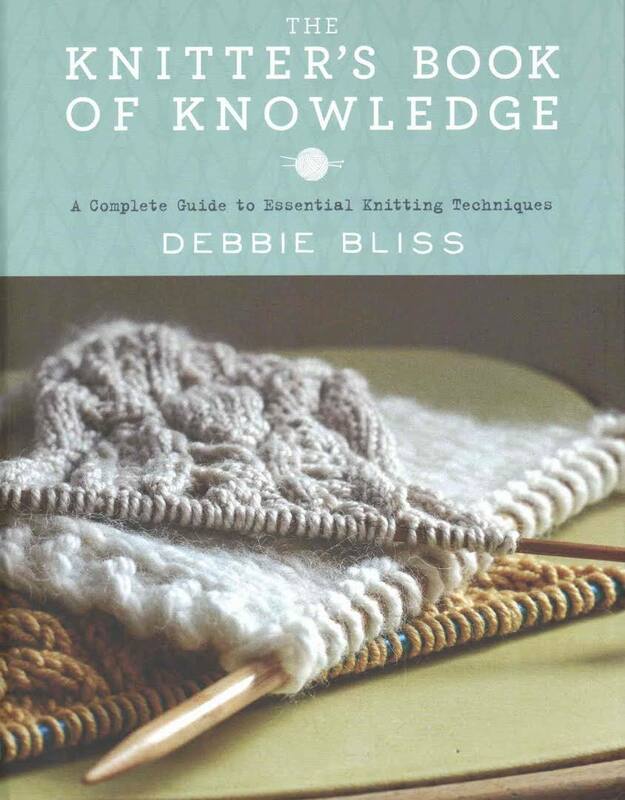 It's a book that will serve beginners and advanced knitters equally well. It's definitely a resource which will be valuable to any knitter looking to learn and then improve their techniques as they tackle more complex projects. One of the things knitters struggle with is vocabulary, we go straight to Google and YouTube for information but if you don't know how to ask the question, finding the answer can be challenging. A good book can be really helpful, allowing you to peruse the index or simply flip through. I heard Debbie speak at an event here in Toronto a number of years ago. She struck me then as a down to earth sort of person and as someone who is generous with her knowledge and very high skill level. Those personal attributes are clearly reflected in this book right from her introduction to the many detailed explanations of techniques which often include extra tips for a range of skill sets. The illustrations by Cathy Brear are clear and large enough to be very useful. There are even two handy pages of knitter's ratio graph paper included at the back of the book. Debbie's web site is here. Full Disclosure, the publisher sent me a free copy to review. I'm happy to be able to give it a two thumbs up review.